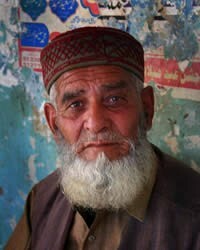 The Jat people are a historical Indo-Aryan tribal group native to the Punjab region. The Jats rose to prominence following the 1669 Jat uprising against Mughal rule, and they ruled various princely states throughout the 18th century. After 1858, under the British Raj, the Jats were known for their service in the Indian Army, being categorized as a "martial race" by the British, specifically in the Jat Regiment, the Punjab Regiment and the Sikh Regiment. It is not known when the Jat people established themselves in the Indian desert. By the 4th century they had spread to the Punjab. According to earlier censuses, the Jat people accounted for approximately one-quarter of the entire Sindhi-Punjabi speaking area, making it the "largest single socially distinctive group" in the region. Traditionally Jats have dominated as the political class in Haryana and Punjab. A number of Jat people belonging to the political classes have produced many political leaders, including the 6th Prime Minister of India, Prime Minister Chaudhary Charan Singh. In 1931, the date of the last census of the British Raj before the abolition of caste, they were distributed throughout North India, mostly in the Punjab and Rajputana. Today, the largest population centre is located in the Punjab region, Haryana and Rajasthan; there are smaller distributions across the world, due to the large immigrant diaspora. The life and culture of Jats is full of diversity and approaches most closely to that ascribed to the traditional Central Asian colonists of South Asia. The Jat lifestyle was designed to foster a martial spirit. Whenever they lost their kingdoms, Jat people retired to the country-side and became landed barons and the landlords with their swords girded round their waists. They would draw the sword out of the scabbard at the command of their panchayat to fight with the invaders. Jat people have a history of being brave and ready fighters. They are fiercely independent in character and value their self respect more than anything, which is why they offered heavy resistance against any foreign force that treated them unjustly. They are known for their pride, bravery and readiness to sacrifice their lives in battle for their people and kinsmen. In the government of their villages, they appear much more democratic. They have less reverence for hereditary right and a preference for elected headmen. The Jat people are required to marry within their community. The Joint family system was popular amongst the Jats and large families use to share the same house and hearth. With the advancement of modern civilization, as people are becoming less dependent upon and less tolerant towards each other, the joint family system is going out of vogue. It was still prevalent in the less advanced areas in the 1930s. Jat marriage ceremonies are traditionally conducted in according with Vedic rituals. The Jats are required to marry within their community. Widow marriage is not only permitted and practiced but is also a social obligation. The Jats make up followers of three major religions: Hinduism, Islam and Sikhism. Today there is a small group of adherents to Christianity, especially Jats living in the in UK. 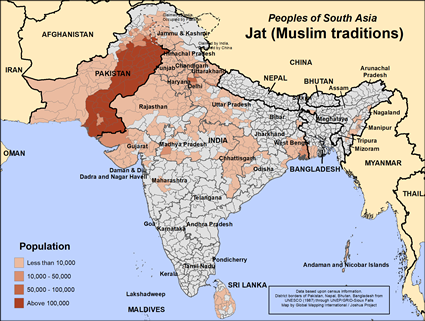 View Jat (Muslim traditions) in all countries.